When you think of the landscape in the Deep South, chances are images of Spanish moss will come to mind. This trailing plant that hangs from trees in hot climates is also known as graybeard, long moss and Florida moss. This humidity-loving plant is most often found by swamps, rivers and other large water sources. Spanish moss is a perennial herb with narrow, 2-inch leaves and small, inconspicuous blue-green flowers. The flowers are lightly scented and secondary to the beauty of the leaves and stems of this hanging plant. Spanish moss does not have roots and thus does not require soil. Rather than using roots to remain grounded to a host, this plant hangs from trees by the stems. Spanish moss hangs from a number of trees in the warmer climates of Central and South America. Warmer parts of the United States -- the Southeast from Florida to Texas -- play host to this magnificent plant as well. This perennial is most often found draped from cypress and oak trees. The cooling effect of Spanish moss did not escape manufacturers’ attention in hot climates, such as that of Florida. From car seats to mattresses, many pieces of furniture and seating were stuffed with dried and cured Spanish moss. Spanish moss served a number of purposes for early Native American tribes. It was brewed in teas believed to reduce fevers, and the strong inner cord of the plant was used to weave materials for blankets and clothing. Tangled webs of Spanish moss create the perfect hiding place for insects and other small creatures such as reptiles. Nests of this cool, soft material are also attractive to bats and birds, including songbirds and the northern yellow bat. Spanish moss spreads by seed and by division. This plant is easy to cultivate since it needs no soil. The key to Spanish moss growth is the correct mixture of heat and humidity. Cultivation requires temperatures above 60 degrees and daily misting with warm water. Spanish moss is not actually a moss at all, nor is it Spanish. 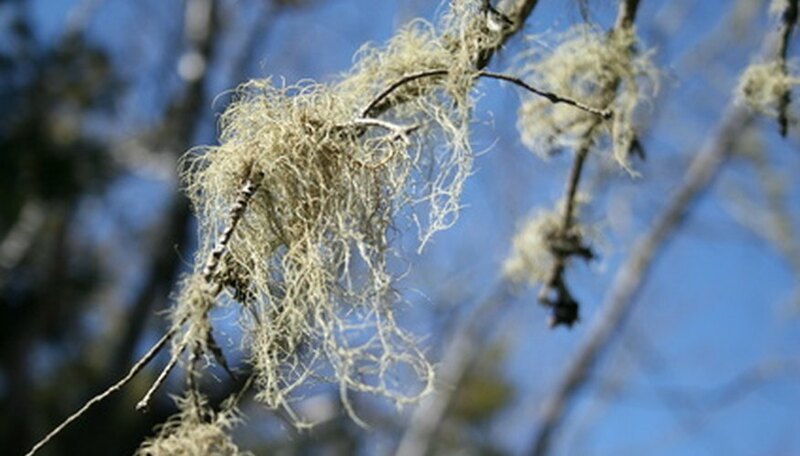 Unlike true mosses, Spanish moss does not leech its nutrients from the host plant. Rather than receiving food from its host, this plant produces its own food. Kay Abbot began writing professionally in 2004. She has written articles for Garden Guides, eHow Home & Garden and Answerbag. Kay has a degree in psychology from the University of Phoenix.